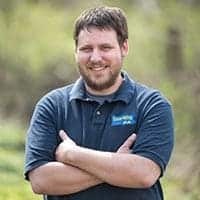 I’ve spent a lot of time hiking in the Pocono Mountains of Pennsylvania and have visited many amazing places: Raymondskill Falls, George Childs Park, and Glen Onoko, just to name a few. However, very few can match the sheer beauty of the Hornbecks Creek Trail. Hornbecks Creek is a small stream hidden away in the mountains of the Delware Water Gap National Recreation Area, a few miles south of Dingmans Falls. Despite the awesomeness of this stream, there is only one sign between the two parking areas and little to give away the beauty located here. Hornbecks Creek, also known in some sources as Indian Ladders, features three waterfalls along with numerous cascades. A trail extends from Route 209 in the south up to Emery Road. However, the trail has been washed out in the middle and a portion of the trail is now closed. 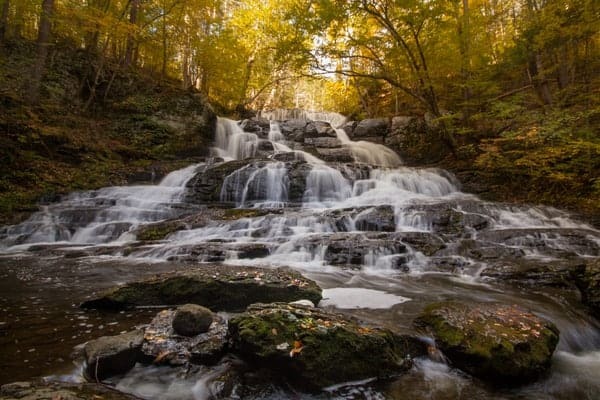 While it’s still possible to see all of the Hornbecks Creek waterfalls, it requires taking two shorter hikes as opposed to one longer one. Note: As for November 2018, the trail along Hornbecks Creek is closed indefinitely due to storm damage. Please do not visit until it is reopened by the park service. Hiking the lower portion of the Hornbecks Trail. From this parking area, a small kiosk sits next to a very obvious trail that follows Hornbecks Creek upstream for approximately one mile. The trail starts off easy, flat, and wide, but does feature several blowdowns that must be climbed over and requires a bit of hiking along the stream. Depending on water levels, it might not be possible to keep your feet dry while hiking. This hike to the lower waterfall on Hornbecks Creek is difficult in spots, but not overly dangerous. A bridge crosses a small creek along the trail. After a mile of hiking, Hornbecks Falls comes into view. Be careful here as the rocks around the creek, even the dry ones, tend to be very slippery. Hornbecks Falls is a slide waterfall that falls in two drops that total about 20 feet in height. In front of the falls is a large, circular pool that makes getting a close look at the falls a bit challenging. Keep in mind when visiting that swimming here is prohibited by the National Park Service. 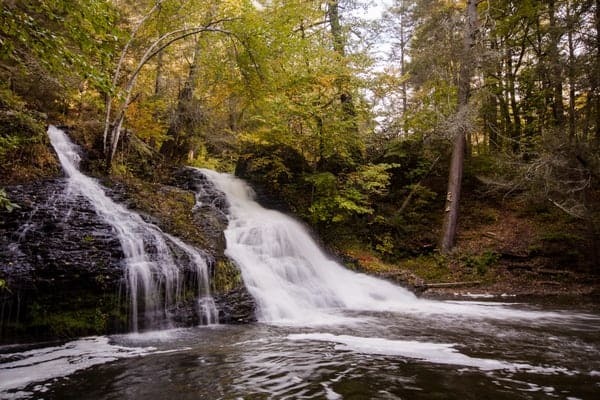 Hornbecks Falls is the furthest downstream of the three main falls along the creek. In the past, the Hornbecks Trail continued on above this lowest falls to the ones above. However, due to erosion issues and lack of a safe trail, this portion of the trail has been closed. So, to see the waterfalls on the upper portion of the creek, retrace your steps back to your car. While the lower part of the trail is beautiful, if you only have time to do one portion of the Hornbecks Trail, hike the upper portion. Not only is it a bit shorter, but it includes two waterfalls (including the creek’s best and tallest drop), along with an impressive gorge. The middle waterfall on Hornbecks Creek is breathtaking. 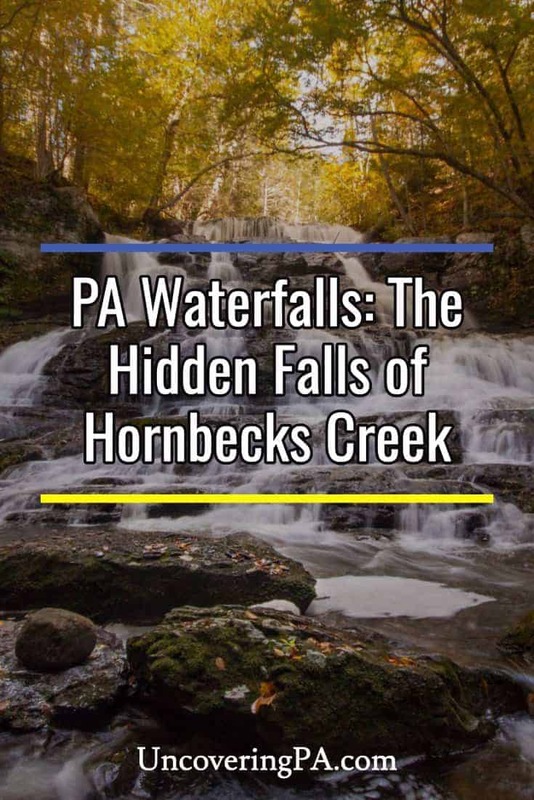 The upper waterfalls of Hornbecks Creek can be reached from a small, unmarked parking area off of Emery Road near the Pocono Environmental Education Center (which is home to Tumbling Waters, another little-visited waterfall). 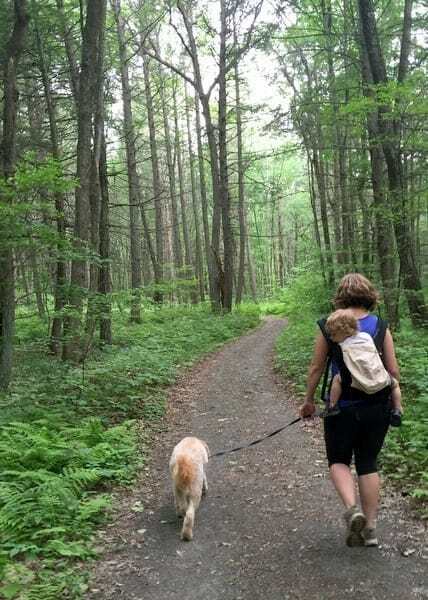 Hiking along the Hornbecks Trail near Emery Road. From this parking area (coordinates are listed below), cross over the bridge above Hornbecks Creek and walk downstream with the creek to your left. The trail here is unmarked, but rather obvious. 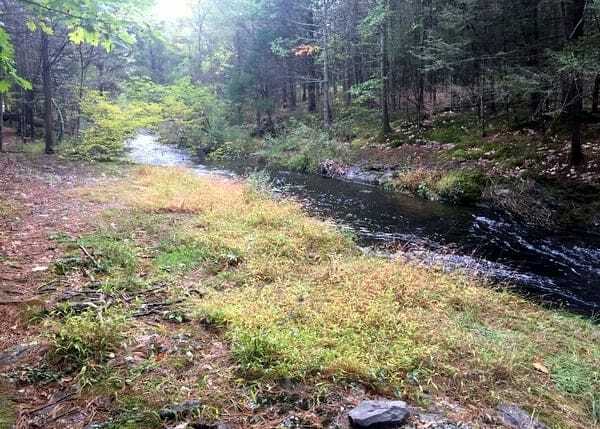 The lack of underbrush in places can make following the trail a bit tricky, but if you simply continue downstream along the creek, you won’t get lost. A few minutes into the hike, you’ll come to the creek’s uppermost waterfall. This approximately 15-20 foot drop is a beautiful slide that often splits around a large rock near the bottom. The uppermost waterfall on Hornbecks Creek. Between this uppermost falls and the large falls, a short distance downstream, Hornbeck’s Creek drops into a deep gorge. In this gorge are several smaller falls, slides, and cascades. Getting a look at most of them is somewhere between difficult and impossible, but there are a few spots where it opens up a bit allowing views of the creek below. Looking down into the gorge created by Hornbecks Creek. 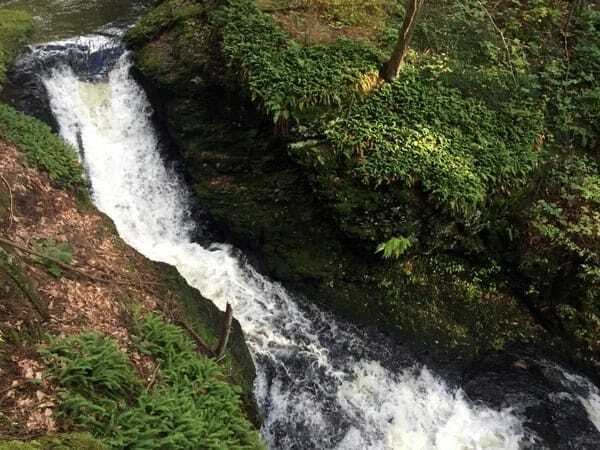 Finally, about a third of a mile south of Emery Road, the trail comes to a set of wooden stairs that takes the trail to the bottom of the largest waterfall on Hornbecks Creek. Often called Indian Ladders Falls (though I’ve also seen it called Goliath Falls), this 35-40 foot waterfall is one of my favorite waterfalls in Pennsylvania. It’s hard to explain exactly why I love this waterfall so much, and I feel like photos don’t quite do it justice. However, standing at the base of this waterfall is a purely magical experience. And, given this waterfall’s obscurity, one you are likely to have to yourself. Indian Ladders Falls is one of my favorite waterfalls in Pennsylvania. 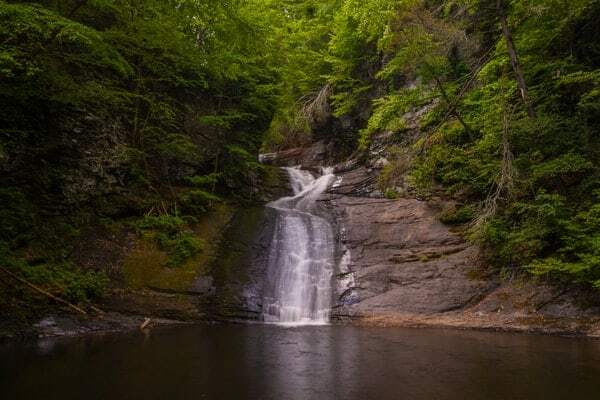 While it might not have the height nearby falls like Raymondskill Falls or Dingmans Falls, this waterfall is one that shouldn’t be missed when hiking in the Delaware Water Gap National Recreation Area. 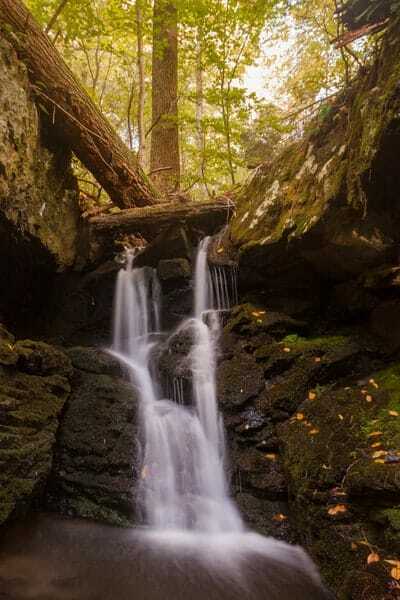 There are a lot of great hiking trails and waterfalls in Poconos, but there’s no question in my mind that the waterfalls on Hornbecks Creek in Pike County rank among the most beautiful out there. 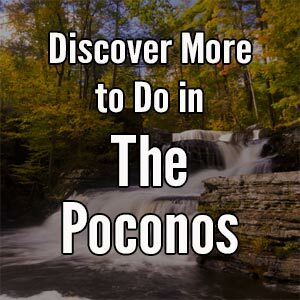 You won’t want to miss this hidden gem on your next visit to the Pocono Mountains. Another small waterfall along the Hornbecks Trail. 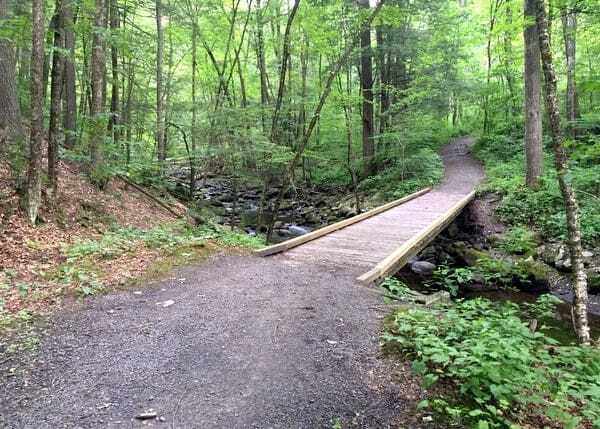 As stated above, there are two access points for the hike to the Hornbecks Creek waterfalls in the Delaware Water Gap. 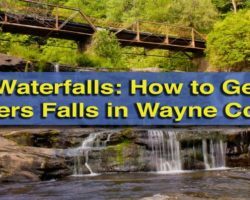 The lowermost waterfall can be reached from an unpaved parking area off of Route 209 near Chestnut Hill Road. 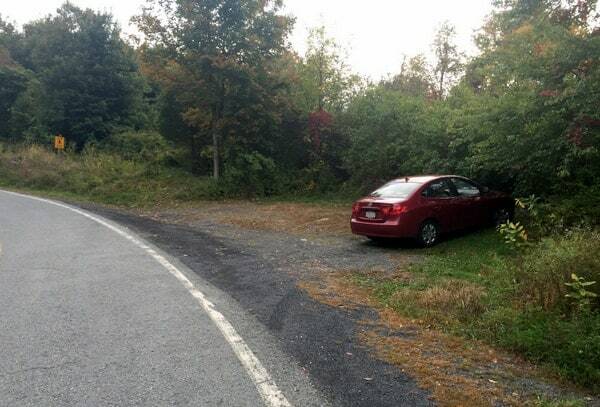 This parking area can be found at the following coordinates: 41.187000, -74.885415. From here, an obvious trail heads into the woods and follows the creek upstream to the waterfall. 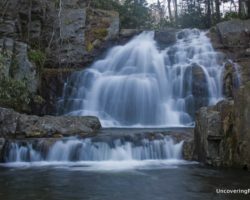 The parking area for Hornbecks Creek’s uppermost waterfalls can be found off of Emery Road at the following coordinates: 41.196111, -74.908831. From this parking area, walk back over the bridge that crosses the creek and head downstream to find the falls. The upper parking area along Emery Road. 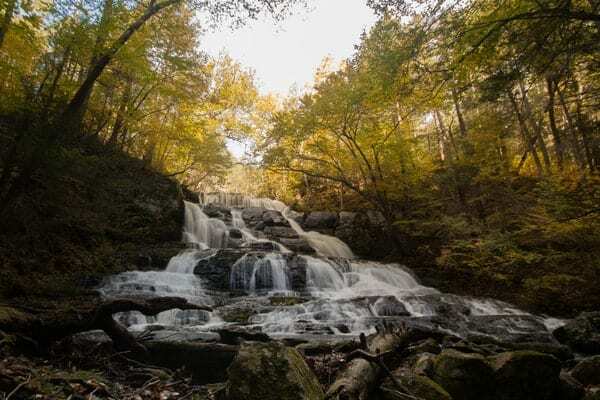 As a reminder, while the Hornbecks Trail used to run the entire length of the creek between Route 209 and Emery Road, it has been closed between the two large waterfalls due to erosion and dangerous conditions. 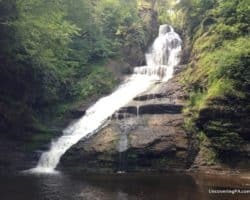 It is best to see the waterfalls on two separate hikes. 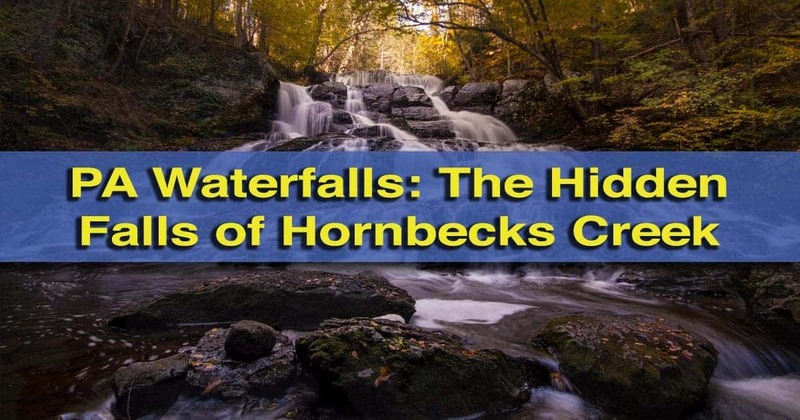 We discovered Hornbeck’s Creek and the waterfall some years ago and have hiked to it from the upper parking area every year since. Rarely is anyone else ever in evidence along this hike. I agree that there is something magical about these falls. One yea, however, it was so dry that there was no water coming over the rocks! A bit disturbing, for sure, but just recently the falls were in full glory. It is my favorite falls in the area. That’s great, Grayce! I’m glad you had a wonderful visit. Enjoy your next adventures. The whole trail is open again and can be hiked from either end. Thanks for great GPS coordinates. That’s good to know. Thanks for the update. I haven’t done the whole trail in one go myself, but top to bottom is probably 2 miles one way. If you just went to the last waterfall and turned around, it’s probably 1.5 miles or so one way.